A vintage NASA spacecraft, the International Sun-Earth Explorer 3 launched in 1978, will fly by the moon on Aug. 10, 2014 after 36 years in space. 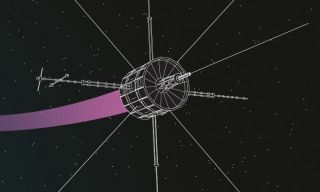 The volunteer ISEE-3 Reboot Project and Google Creative Lab have teamed up to offer a live webcast of the 36-year-old spacecraft's lunar flyby. Officials announced this week that they would collaborate with Google to offer live spacecraft data at the site SpacecraftForAll.com. Financial terms were not disclosed. Chris Lintott, of the BBC's "The Sky at Night," will moderate the Google Hangout on ISEE-3 today. "The main feature of this is a new website developed by Google Creative Lab in collaboration with the ISEE-3 Reboot Project team that features a history of the ISEE-3 mission as well as a presentation of data currently being received from ISEE-3," co-founder Keith Cowing said in a statement. The spacecraft was originally launched in 1978 to study the sun, and was retasked for other science missions such as looking at comets. NASA put ISEE-3 into hibernation in 1998, where it remained until the private group reactivated it this year under a Space Act Agreement. Members raised about $160,000 through crowdfunding, most of which is gone due to the need to rent dish time at NASA's Deep Space Network to listen in, and to fly team members to the Arecibo Observatory in Puerto Rico for communications. To learn more about the ISEE-3 Reboot Project, visit: http://spacecollege.org/.